Popular mobile recycling company, RPC Recycle has recently announced that they have raised £614.38 for Prostate and Testicular Cancer charities. The money was raised through a firework night display which was attended by staff from RPC Recycle, Comm-Tech and Juice Telecoms. The fireworks were hosted by the managing director of the three companies, Justin Millar and over 200 people turned up to view the fireworks and donate money. As well as raising money for the charities through the firework night the three companies including RPC Recycle are also raising money by taking part in the popular Movember. Movember makes men grow ‘sponsored’ moustaches to raise money and awareness for men’s health especially prostate cancer. In 2010 Movember raised £48.5 million for Prostate Cancer charities so RPC Recycle are proud to support the charity again for the second year running. There is now over 1.1 million people around the world taking part in Movember every year. You can learn more about Movember and the charities they support here. 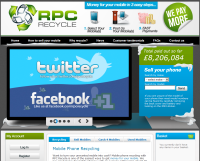 RPC Recycle is a specialist mobile recycling company who will buy old mobile phones, iPods, iPhones and tablets for cash payments. Since launching a couple of years ago they have paid out over £8 million to their customers. They offer competitive prices on all mobile models, Apple devices, Blackberries and tablet computers. Payments are sent quickly and conveniently via cheque, BACS or Paypal within 48 hours of your old handset being received. When you use the site to sell your unwanted handsets and devices you can rest assured that they will not end up at a landfill site where they will cause much damage to the environment. Any unwanted devices and mobile phones that are received will be refurbished by the company and then either re-sold in the UK or in developing countries where mobile phones are essential for communications. Any handset that cannot be re-used will be broken down and recycled in line with the UK Waste Electronic and Electrical Devices (WEEE) directive.